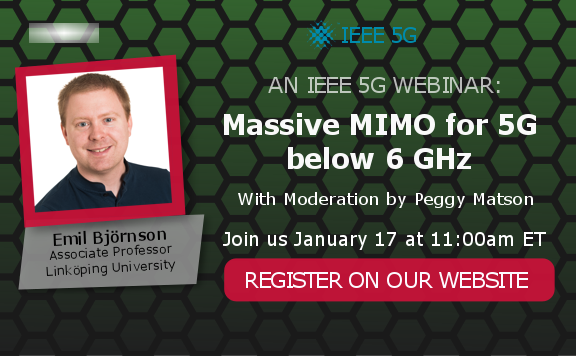 On January 17, I will give a 1-hour webinar in the IEEE 5G Webinar Series. I was asked to talk about “Massive MIMO for 5G below 6 GHz” since there has been a lot of focus on mmWave frequencies in the 5G discussions, although the primary band for 5G seems to be in the range 3.4-3.8 GHz, according to Ericsson. The full title of my webinar is Massive MIMO for 5G below 6 GHz: Achieving Spectral Efficiency, Link Reliability, and Low-Power Operation. I will cover the basics of Massive MIMO and explain how the technology is not only great for enhancing the broadband access, but also for delivering the link reliability and low-power operation required by the internet of things. I have made sure that the overlap with my previous webinar is small. If you watch the webinar live, you will have the chance to ask questions. Otherwise, you can view the recording of the webinar afterward. All the webinars in the IEEE 5G Webinar Series are available for anyone to view. As a final note, I wrote a guest blog post at IEEE ComSoc Technology News in late December. It follows up and my previous blog post about GLOBECOM and is called: The Birth of 5G: What to do next? Being a power engineer and not familiar with the limitations 5G faces, I ask the following questions. Must the antenna array be stationary? I think of rotating satellites, weather Doppler radar, rotating lasers used on building construction sites. Different frequencies but possible at <6 GHz. No, the array needs not be stationary. The typical Massive MIMO protocol breaks down the transmission into coherence intervals, whose time duration equals the time that the channels is approximately static. But between coherence intervals, the channel may change in any way you like. This can be due to small movements or rotations of the arrays and (more commonly) the user device.